I’m one of those people who believes in the power of prayer. “Prayer” is an interesting concept, meaning different things to different people — and taking different forms. For the most part, I’m not a formal pray-er, nor even someone who prays with words. I certainly don’t want to be telling God what to do. I’m more of an “attitude of prayer” pray-er. I can’t even say meditative. More like contemplative, or maybe I should say ruminating. There are two definitions of ruminating: one is disciplined thinking and caring about something; the other is when an animal like a cow has already eaten something but not digested it, so she brings it up from one of her two* four stomachs to chew it more. From a chamber with one purpose to prepare it for a chamber with a different purpose. Prayer as sitting outside in the sunshine, “chewing something over” to make it more functional, while at the same time mulling, caring. I also frequently say that I hold someone in my heart as a form of prayer. We talk about our hearts as our emotional centers, but that’s just a metaphor. In physical truth, our hearts are four-chambered organs vital to our existence. But I say it because it has shared meaning — not something I need to explain. But this is the one I like most. 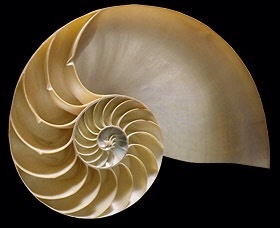 Prayer as the chambered nautilus. A newly hatched nautilus wears a shell divided into four small chambers. As a nautilus grows, it gains more living space by building new chambers connected to the old ones; adult shells have 30 chambers (from the Monterey Bay Aquarium website). Here we have an ocean-dwelling creature that starts out small, with four chambers (like the human heart), but as it matures, it grows more and more of these beautiful, pearlescent chambers — separate, yet interconnected — as many as needed. A wonderful image to visualize as my form of prayer. And so when I say that I hold someone in prayer, this is what I mean. * Funny how certain “facts” we’ve known forever end up to be untrue. A friend informed me that cows have four stomachs. Doesn’t change my metaphor, but it’s fascinating nonetheless.